So, if unfulfilled prayer is not the result of our failure to live for Christ or unconfessed sin in our lives or inadequate faith, then what are we to make of the fact that our prayers are sometimes unanswered? Perhaps the answer is not found in what we do wrong when we pray, but in our failure to understand what Jesus meant when He said that we could move mountains and have whatever we ask for if we pray with faith. Live for today, and put tomorrow into God's hands. Begin to eliminate the words 'what if' from your vocabulary. God will always be one step ahead of you. 'The Lord, He is the One who goes before you. He will be with you, He will not leave you nor forsake you; do not fear nor be dismayed' (Deuteronomy 31:8 NKJV). The reason God is called the 'Alpha and Omega' in Scripture is because He not only initiates the starting point of your spiritual journey, He has arranged every step of it according with His will. He says to you: 'I know the plans I have for you, says the Lord. They are plans for good and not for disaster, to give you a future and a hope...when you pray, I will listen...I will end your captivity and restore your fortunes' (Jeremiah 29:11-14 NLT). I was very impressed when I read a short write up by R.T. Kendall on "Thank God for Unanswered Prayer".What he says is very apt, precise and thoughtful. I have lived long enough, as far as I can tell, to thank God for every unanswered prayer. That is, prayers prayed in the distant past. To be honest, I have offered prayers more recently that have gone unanswered (so far), which makes no sense to me at all. But I predict that, in the end, I will have no complaints. God is not only sovereign, but He is also loving and gracious. No good thing does He withhold from those who sincerely try to do His will in everything (Ps. 84:11). Unanswered prayer is still an enigma—that is, puzzling in the light of Jesus' words, "You may ask me for anything in my name, and I will do it" (John 14:14). God does not answer prayers that are not in His will. After all, John said, "This is the confidence we have in approaching God: that if we ask anything according to his will, he hears us" (1 John 5:14). I can only conclude that asking in Jesus' name must in some direct sense relate to God's will. The enigma of unanswered prayer lies in the apparent incongruity between what seems good to us at the time and what God knows is good for us. Sometimes our prayers, which seem so right, flow from a faulty theology. When we are in love with our theological assumptions—and can't imagine they could be wrong—we tend to presume God surely agrees with us! The disciples asked the resurrected Christ, "Lord, are you at this time going to restore the kingdom to Israel?" (Acts 1:6). It had not crossed their minds that Jesus never once planned to do anything of the kind. Although unanswered prayer is a mystery, there is also an explanation. It is only a matter of time before we will be given an explanation. But it comes down to this: God has a better idea than that which we asked for. If you're fearful of the future, check with the past. 'Blessed be the Lord, who has given rest to His people...according to all that He promised. There has not failed one word of all...He promised' (1 Kings 8:56 NKJV). You will never conquer your worries entirely, for worries, just like weaknesses and character flaws, draw you closer to God and keep you dependent on Him. 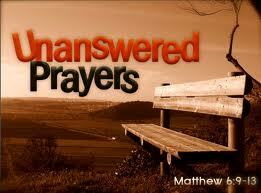 (1) S. Michael Houdman, CEO, Gotquestions.org, How should a Christian respond to unanswered prayer?